This week’s challenge on the Late Night Stamper Group is Celebrate! Spring is a time for celebrations and I have two reasons to celebrate. Both of my kids are graduating in the next two weeks. So I am a very proud Mother!! 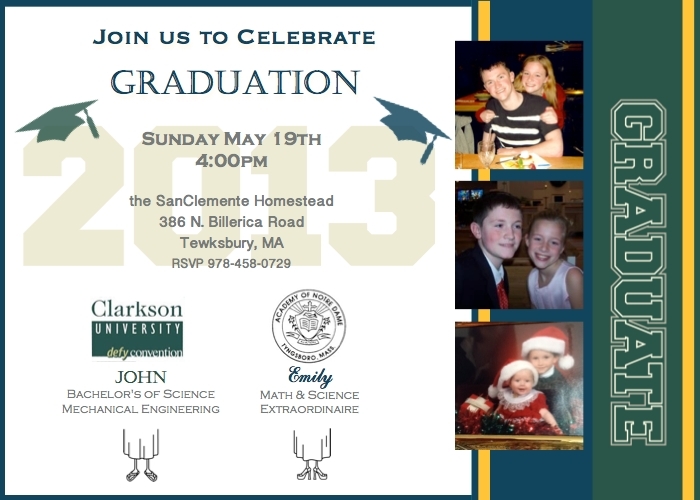 My son John, is graduating from Clarkson University with a BS in Mechanical Engineering on May 11th. What a great Mother’s Day present. My lovely daughter is graduating from the Academy of Notre Dame (High school) on Sunday May 19th. So as you can imagine we are celebrating!! I put together a Graduation announcement/party invite using My Digital Studio. I love this program! I downloaded the Embark Graduate MDS Ensemble and used the template for a card that was included in the program. Then of course I had to customize it to represent the two schools that my kids attend. Clarkson’s colors are dark green and gold. Notre Dame is Navy and Gold. I then added the logo for each of their schools. The feet are from the “Go Graduate” stamp set. I have to say that I am really happy with the way this card came out! So what is next for me and my family? I will have an empty nest in the fall. My daughter will be attending Sacred Heart University in Fairfield, CT to study Pre-med/Pharmacy. My son will be starting a job with Dresser-Rand. As he said – “this college thing pays off”! Thanks for looking! graduation announcement, handmade, My Digital Studio, Stampin' Up!. Bookmark. Very nice invitation. I love it and thanks for joining us last week on LNS! Congratulations! What a super page. I absolutely love this invitation. Both my kids are graduating this year (one from high school and the other from college). I’m very new to the stampin’ up world and MDS and was wondering if the 2013 can be changed to 2014? Can the downloads be used in other programs as well such as Photoshop Elements? TIA!! Hi Kathleen – yes to your questions.. Do you have MDS? MDS can be used with other photo editing programs… I can also put something together for you with your pictures and send you a jpg that you can add to a word document and print. Send me an email at marilyn.sanclemente@comcast.net and we can talk some more! !